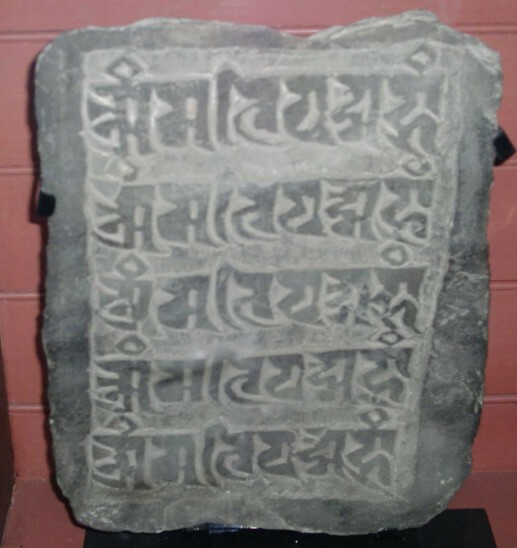 Mani stones are stones that are carved with the famous Sanskrit mantra oṃ maṇi padme hūṃ, which is known periphrastically as the "six-syllable mantra" (liùzì zhēnyán 六字真言 in Chinese and yi ge drug pa in Tibetan). 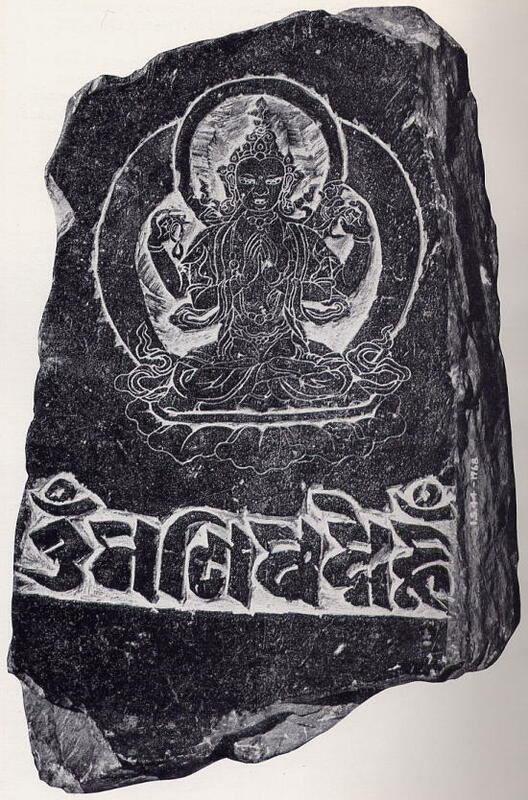 The origins of the mantra are obscure, but it is normally associated with the bodhisattva Avalokiteśvara (Tibetan spyan ras gzigs "Chenrezig"), particularly his four-armed manifestation, Shadakshari ("Lord of the Six Syllables"); although it has been suggested that it was originally an invocation to a female consort of Avalokiteśvara called Manipadma (see this Early Tibet post for a discussion of the limited association of six-syllable mantra with Avalokiteśvara in early Tibet). All the priests shave their heads, and are dressed in saffron color, and they observe chastity from the time they shave their heads, and they live in congregations of one or two hundred. On the days when they go into the temple, they place two benches, and they sit in the region of the choir but opposite the choir, with books in their hands, which they sometimes put down on these benches; and they keep their heads uncovered as long as they are in the temple, reading in silence and keeping silence. And when I went into one of their temples at Caracarum, and found them thus seated, I tried every means of inducing them to talk, but was unable to do so. Wherever they go they have in their hands a string of one or two hundred beads, like our rosaries, and they always repeat these words, on mani baccam, which is, "God, thou knowest," as one of them interpreted it to me, and they expect as many rewards from God as they remember God in saying this. Here is my attempt to display the six syllables in their six colours as text. I have had to write pad and me separately (as they less commonly are), as I don't think it is possible to colour the individual components of a single dme glyph in different colours. Nik Douglas, Tibetan Tantric Charms & Amulets (Dover Publications, 1978) No.29. John Lowry, Tibetan Art (London: Her Majesty's Stationery Office, 1973) plate 49. Whilst mani stones in Tibetan, Lantsa or Wartu scripts are most common, the mani formula may also be written in a variety of other scripts, and I thought it would be interesting to collect examples of the six-syllable mantra in as many scripts as possible, a sort of I can eat glass project for Buddhist epigraphers. Another extinct and as yet unencoded script that the mani formula has been written in is Jurchen (女真文). 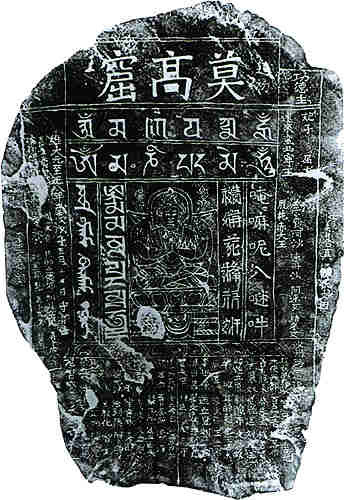 The illustration below (apologies for the poor quality) is from an early Ming dynasty stone monument commemorating the founding of the Yongning Temple 永寕寺 in the 11th year of the Yongle period  in the district of Nurgan, located near the mouth of the Amur River in what is now part of Russia (the actual monument is in the Vladivostok Museum). Jin Guangping 金光平 and Jin Qizong 金啓孮, Nüzhen Yuyan Wenzi Yanjiu 女真語言文字研究 (Beijing: Wenwu Chubaneshe, 1980). The mantra is normally written with padme as one word, but it may be written as two words (pad me), as in the 1348 and 1413 inscriptions shown above. In modern Lhasa Tibetan the mantra is pronounced om mani peme hung. Lantsa (Ranjana), Wartu (Vivarta) and Siddham (Chinese xītán 悉曇 or 悉檀) are three closely related scripts, and from a character encoding point of view they could be considered to be variant styles of the same basic script. Shushi Huiyao 書史會要 vol. 8 folio 6b. A final note on the character 吽 hōng that is used to transcribe hūṃ. The first five characters of the mani formula in Chinese (唵嘛呢叭咪吽) are each written using a mouth radical on the left to indicate that the element on the right is being borrowed as a phonetic approximation, but the last character is written with a mouth radical on the left and the character for an ox (níu 牛) on the right, which is not in this case a phonetic. The Tang dynasty monk Huilin 慧琳 (737-820) explains the character 吽 hōng thus : "It is like the sound of an ox bellowing, or perhaps an angry tiger; the sound comes from deep within the throat" (如牛吼聲，或如虎怒，胸喉中聲也). The six characters of the mantra in the 1413 inscription are all easily identifiable. * Characters are displayed using Jason Glavy's Jurchen font. If you do not have this font installed you will see Chinese characters instead. ** The readings are the phonetic reconstructions of Jin Guangping 金光平 and Jin Qizong 金啓孮 in Jin Qizong 金啓孮, Nüzhenwen Cidian 女真文辞典. Beijing: Wenwu Chubanshe, 1984. The Tangut characters for the first five syllables of the mantra in the 1348 inscription are easily identifiable, but the sixth character is not to be found in Li Fanwen's Tangut-Chinese dictionary, and I was originally unable to identify it. However, now that I have been given a copy of Wenhai Yanjiu 文海研究 I have been able identify the character in the inscription as a variant form of the Tangut character specifically used for transliterating Sanskrit hūṃ. Notice how the four-stroke element on the right side has been simplified to 干 in the 1348 inscription. * The readings are the phonetic reconstructions given in Li Fanwen 李範文, Xia-Han Zidian 夏漢字典 [A Tangut-Chinese Dictionary] (Beijing: Zhongguo Shehui Kexue Chubanshe, 1997). 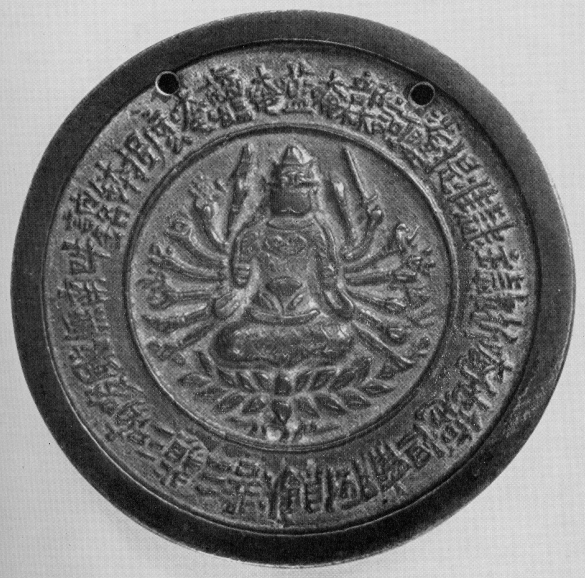 There is also a bronze mirror with the image of a Buddha surrounded by the the mani formula in Tangut script. I haven't got a good picture of it, but you can buy a replica of it from 宁夏特产网 (you can also buy a set of replica Tangut coins if you want). Meanwhile here is a copy of the inscription of the mirror given in the 1935 edition of Yin Tong 音同 "Homophones". My transcription of the Uighur text of the 1348 inscription is tentative. The Mongolian text on the 1413 Yongning Temple monument is far from clear, and my transcription is tentative only. However, there are clear similarities to the Uighur version of the mantra with respect to spelling. In more recent Mongolian texts the six-syllable mantra is spelled very differently from the 1413 inscription, and makes use of a special candrabindu sign. I haven't got an image of a Mongolian script mani stone yet, but in the meantime I have included an entry in the table for how I think the mantra should be written in standard Mongolian script (cf. 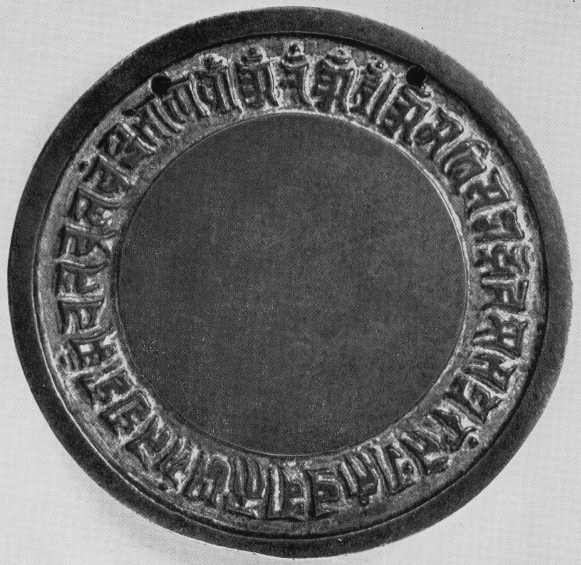 the representation of the six-syllable mantra on a bronze incense burner in front of the Gandan Monastery in Ulaanbaatar shown on page 8 of Oliver Corff's MonTEX, A Quick Guide). 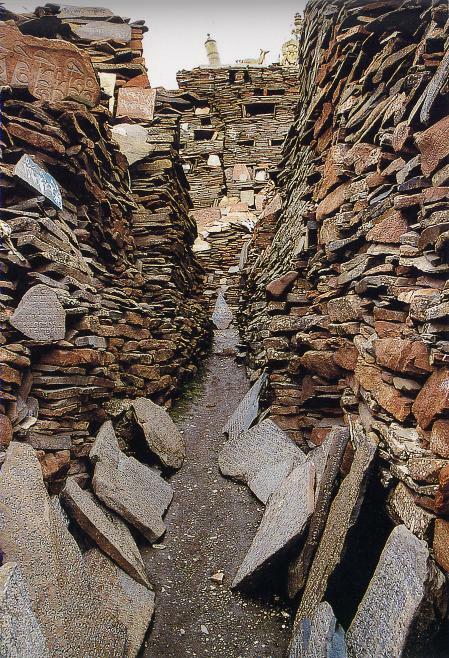 I can think of several more scripts (Manchu, Khitan, Soyombo, Siddham, Kharoshthi, Tocharian, Orkhon ...) that may have been used to write Buddhist mantras, so feel free to send me examples of mani stones in other scripts and I will update this page. And the mantra can be written in Tibetan script either as ཨོཾ་མ་ཎི་པད་མེ་ཧཱུཾ or as ཨོཾ་མ་ཎི་པདྨེ་་ཧཱུཾ. When written the second way, the DA(ད) in the stack DME(དྨེ)should still have the same light blue color as the preceding letter PA (པ), while the subjoined MA and superscribed vowel in the stack should be separately colored red. It seems none of the creators of the numerous popular OM MANI PADME HUM screen-savers available realize this and always seem to colour the whole stack DME red. Thanks for that. I hadn't really given colour much thought, but perhaps I ought to add a coloured illustration of the mani formula to the post. 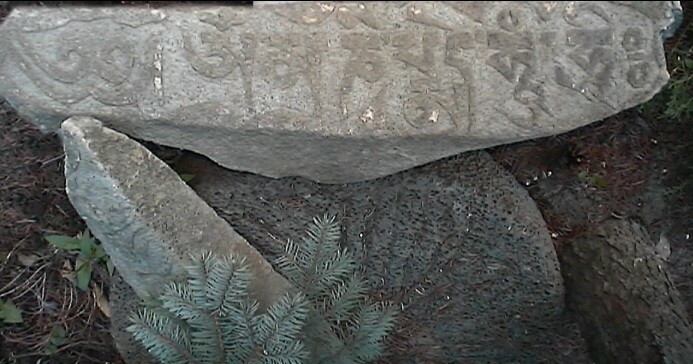 You can see the colouring scheme you describe in this picture of the mani formula on a boulder nearby the Potala Palace in Lhasa. I have now updated the post to show a coloured mani stone. The big problem is how to colour padme correctly using HTML/CSS. Thank you very much for very interesting research. I wanted to ask about Tibetan writing of the mantra. You didn't say anything about difference in writing final hūṃ with SNA LDAN (anunāsika)(ཧཱུྃ) and RJES SU NGA RO (anusvāra) (ཧཱུཾ) signs. But we see SNA LDAN on 1348's Monument (莫高窟造像碑) not RJES SU NGA RO. Which one is correct? I don't see variant with SNA LDAN in "The Six-Syllable Mantra in Various Scripts" final table also. Why so? That's a very good question. I don't know which way of writing hūṃ is correct. I think that hūṃ with SNA LDAN (ཧཱུྃ) is more common in printed texts, but that maybe hūṃ with RJES SU NGA RO (ཧཱུཾ) is often used in carved versions of the mantra in order to make it more impressive. I have updated the table to show both variants. If you have Google Earth try going to 32°54'33.37"N, 97° 2'48.78"E and rotate 180° (or click here, view larger map and select Satellite view) to see the world's largest example of the Mani formula (180 metres across). It's tangential to the main subject of the post, but I have a question about the seed syllable hrīḥ in Tibetan Unicode: You have ཧྲཱི༔, with U+0F14 TIBETAN MARK GTER TSHEG. I'm wondering if it shouldn't be ཧྲཱིཿ, with U+0F7F TIBETAN SIGN RNAM BCAD (visarga)? Or can both characters be used for different ways of writing the same thing, like SNA LDAN & RJES SU NGA RO above? (My font has a horizontal mark between the circles in U+0F14 but not U+0F7F, & I have seen it written both ways.) Alternatively, is it perhaps sometimes written hrī & only incidentally happens to be followed by a U+0F14 which resembles U+0F7F? Hmm, I'm not sure. I assume that I used U+0F14 because on the inscription there is clearly a line between the two circles. But now I think about it I don't know whether this is a glyph variant of U+0F7F that just looks like U+0F14 or whether it really is U+0F14 -- which is frequently used at the end of mantras. I'll have to think some more about it (and look for some more examples), but hopefully someone who is more knowledgable about Tibetan will be able to give us the answer. Hi, in your blog, you used Mongolian U+1024 (u) for Sanskrit u, and U+1024 U+1838 U+1820 (uwa) for Sanskrit o. Are you sure? Because U+1023 and U+1024 look the same. U+1025 and U+1026 look the same too. The stand-alone Sanskrit u looks like ᡝᠪ without the long tail. It seems that only U+1026 has this form. Thank you very much. Thank you very much for this post. I was puzzled by the meaning of this engraving in the Spiti valley (Himachal Pradesh, India); you are welcome to use pictures of large piles of Mani stones on Kunzum Pass here and here. Only from this article, I got the idea of the meaning of the mantra. My choice of characters to represent the Mantra in Mongolian is based on page 49 (Figure 9.1) of Mongolian and Manju for Latex2 by Oliver Corff. 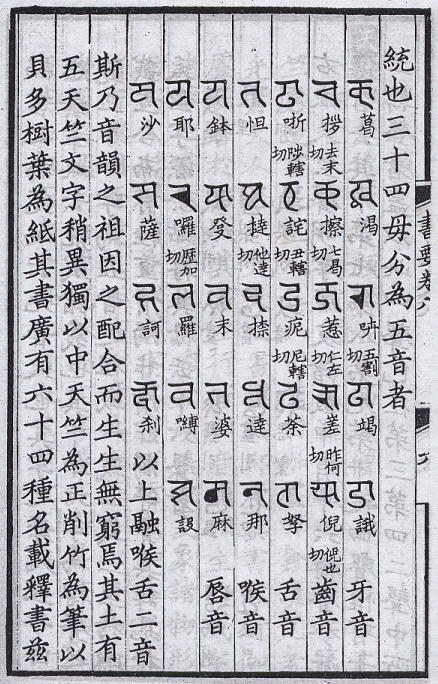 I have now made available on my website some scans from Tongwen Yuntong 同文韻統 which show how to represent Sanskrit and Tibetan using Mongolian and Manchu scripts. Your pictures are very nice, so I might well borrow one of them. I have both Wenhai Yanjiu and the Mojikyo fonts and fluent in Chinese. My problem is I don't know how to begin finding anything in Wenhai Yanjiu (I looked up your numbers and they correspond in the index, but I can't find the character in the body of the book). And Mojikyo seems ordered haphazardly, how can I find them to get them on a computer? Yeah, Mojikyo's really evil, so I won't try to explain how to use it. Probably best to wait a couple more years until Tangut is in Unicode. As to looking up characters in WHYJ, you need to look up the four-digit number from the radical/stroke index in the index at the back of the book, which will give you a list of page references where the character occurs in the form x.abc where 'x' is the page number, 'a' is the 1st or 2nd side of the page, 'b' is the column on the half-page, and 'c' is the head entry in the column. You can then look up the entry in either the original Tangut, reproduction Tangut or Chinese translation. But you need to be able to read the Tangut numbers in the margin in order to look up the entry in the Tangut text. Nice article and an interesting collection of pics. You say "It is not known when the mantra came into use". The mantra first appears in a text called the Kāraṇḍavyūha Sūtra which Alexander Studholme dates to the 4th century CE in his study of the text (The Origins of Oṃ Maṇīpadme Hūṃ: A Study of the Kāraṇḍavyūha Sūtra. State University of New York Press, 2002.) So it had to have come into use by that time. I am still unable to get the proper shaping, but that's because not even Windows 10's UniScribe has Siddham awareness. Maybe you can figure out how to get the proper shaping.